Are you constantly wondering why there are so many misunderstandings between you and your teenager? The Early Show has the answers Monday morning. Lara Fox and Hilary Frankel, both 18, are the experts. 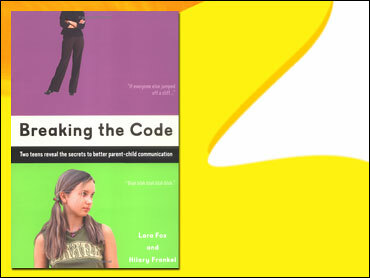 They are the authors of "Breaking the Code," a book that seeks to bridge the gap between parents and their teens. When they were 16, they got the idea to give parents advice on how to communicate with their teens. Their intention, they tell parents in their introduction, is to provide a "guide to what teens really hear when you speak, and how you can make them hear what you are actually trying to say." "Basically," Hilary Frankel tells co-anchor Rene Syler, "Most parenting books are written by psychologists or other adults. They take educated guesses on what a teenager is thinking to help parents. Lara and I started talking about well, who is really the expert? Wouldn't it be better just to ask a teenager what a teenager is thinking?" The book, Fox says, is a reflection of the good relationship they have with their parents. "We are able to talk openly about what went wrong and how to fix it," she says. "Of course, they recognize that they're in there as well and they have faults and we have faults. We've been able to work through it." Do not say, "Your room is my room" – Frankel says it is important to a teenager to have his or her own space. "As a teenager, you have so little personal space," she explains. "Your room is the one space that you can have. You hear: Clean your room; take care of your room; go to your room. Then the next second: This room is my room." And yet, Syler notes, it is the parent who pays the bills. "Of course," Fox says, "but the difference is that if you send your child to their room, they feel like this is their space now. Once you've designated it as their space, and you're taking it away, they feel sort of violated. You can't send them to their room then say - that's actually my room." Do not say, "Look on the bright side" - Fox explains, "You're trying to make us feel that there's something to look forward to, there's a way to make up for it. But instead, a teenager feels like they just want to wallow in their misery and they want you to listen. They feel like you're belittling what they're saying, and you're not just hearing them out." Frankel notes that it is important for parents to encourage their children but first, they should just hear their children out. "It is just that when your teenager comes to you in the beginning and they're upset, did poorly on a test, you have to give them a chance to vent," she says. Do not say, "Because I said so" – This really means parents don't have time to explain and teens would not get it anyway. Frankel explains, "For a teenager, it just feels like it's sort of like you're saying you're too immature to understand. Even if you do say it, come back and explain the next day or an hour later the actual reasoning for the rule or whatever." Their reasoning is that if teenagers are able to respect and understand rules of the house, and know where parents are coming from, they are more likely to obey them. Teenagers are young adults who feel they've earned the right to ask why and get a logical answer. Do not say, "In my day..." – Fox explains, "Every teenager feels like it's a trigger to a lecture you're about to go into - why you're upset about something. So instead, if you want to start a lecture, you can say: I know you know this already, but hear me out. This way they feel like they're on your level and you're not about to start on the condescending conversation." Another tip they shared is parents should avoid saying: "We have plans with family friends tomorrow." Fox and Frankel say it sends the message that parents don't have regard for their personal time. Fox explains, "They feel that this is a personal privacy issue that they have their personal space and their personal time. If you can rephrase it and say: Do you have plans Friday or Monday night? And give them the option so they feel like this is a negotiation and they are part of the family."